In this section you can customize Matukio to your needs. You can hover over each options label to see an detailed explanation (Tooltip), which describes what the setting does. Each tab has an intro text which settings you can find in it. Please note that some settings only apply to the modern template and others only to the bootstrap 3 one. It's basically divided into 8 sections, for most users the first four are the important ones. You can always reset all settings to the default by clicking on the reset button in the top menu. They are completely recreated, so this is also working if the settings are for some reason broken. 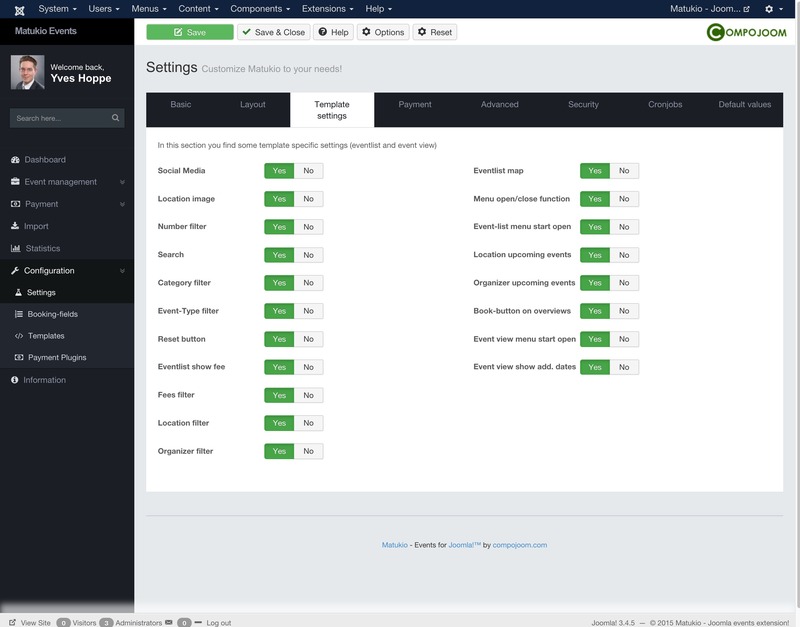 Click on the Options button in the top menu to access the Joomla ACL settings for Matukio. By default organizers in the frontend are only allowed to edit / manage their own event. Even if they have core.edit and not only core.edit.own. There is a setting for changing that (Allow everyone to manage all events in the frontend).